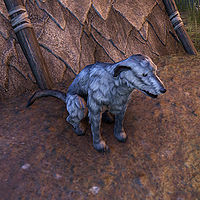 Dogs are aesthetic passive creatures found around settlements. There are several breeds, such as a hound breed, a black breed, and Wolfhounds. As they are aesthetic creatures, they cannot be attacked, and do not take damage. Lost on Bleakrock: Find a missing fisherman. Questionable Contract: Help a hapless Altmer fulfill his contract. Until Death: Help find a woman's missing husband and their dog. Several dog vanity pets exist. This page was last modified on 25 July 2018, at 13:12.